Every Wednesday from 6 to 7 pm the Wangka Maya Pilbara Aboriginal Language Centre is offering the opportunity to practice your Aboriginal language skills in the Wangka Maya conference room at 67 Throssell Road in South Hedland. For more information contact manager@wangkamaya.org.au or call Julie or Jason on 9172 2344. YMAC’s Board of Directors, Regional Committee, Management and Staff wish you a happy, healthy holiday. 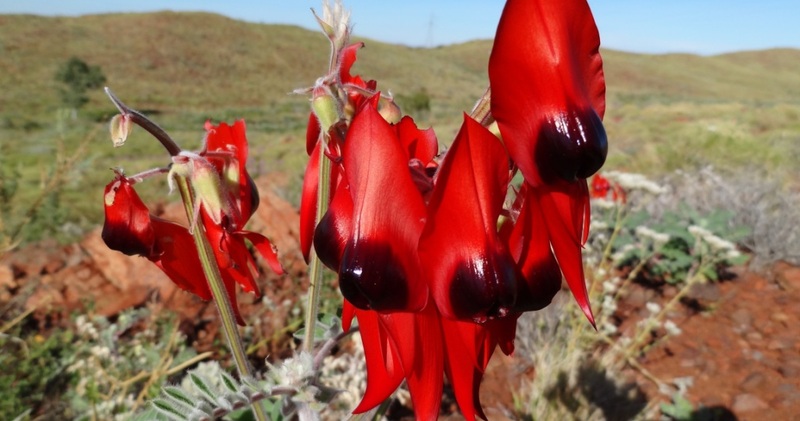 For many Aboriginal Communities in the Midwest and Pilbara, December to January is a special time of year to observe cultural obligations and practices. Out of respect for these traditions, YMAC will not be conducting any heritage surveys between Monday 16 December 2013 and Monday 3 February 2014. Any heritage survey requests received after 16 December will be scheduled to commence after 3 February. All YMAC offices in Perth, Geraldton, South Hedland and Tom Price will be closed during the festive season from Monday 23rd December 2013, re-opening on Thursday 2 January 2014. The Town of Port Hedland will be holding its next Aboriginal Consultation Forum on Monday, September 9 at Lotteries House from 9am-1pm. The forum has been set up as a way for Aboriginal and non-Aboriginal community members, council officers and local businesses to make connections and discuss issues important to them. The topic for this forum is “Networking and Information Sharing”. The discussions will be shaped around suggestions from attendees on the day. Please pass on this invite to anyone you feel would be interested in the discussions. All members of the Aboriginal community are welcome. If you would like to attend, please RSVP to this email address for catering purposes: eacd@porthedland.wa.gov.au. There are still a couple of days left to register your organisation, group or business to take part in the 2013 Welcome to Hedland Community Expo, which takes place Friday 17 May from 5pm to 9pm at the South Hedland Town Centre. The expo is an annual celebration of the Hedland region, giving community groups and businesses the chance to to connect with new residents and existing locals, with this year’s event shaping up to be the most exciting yet. If you would like to host a stall, perform or do a demo at the expo, go to the Town of Port Hedland website or download a registration form here. For more information, call (08) 9158 9660. Registrations close this Friday, 3 May. Out of respect for these traditions, YMAC will not be conducting any heritage surveys between Monday 17 December 2012 and Friday 1 February 2013. Any heritage survey requests received after 17 December will be scheduled to commence after 1 February. All YMAC offices in Perth, Geraldton, Karratha, South Hedland and Tom Price will be closed during the festive season from Thursday 20th December 2012, re-opening on Wednesday 2 January 2013. YMAC’s Board of Directors, Pilbara and Yamatji Regional Committees, Management and Staff would like to wish you a happy and safe festive season. The Bloodwood Tree Associationg would like to invite you to the 2012 Peacock Masquerade Annual Ball, being held this Saturday 27th October 2012 at the Wanangkura Stadium in South Hedland. The ball is a charity event raising funds for suicide prevention programs in the Pilbara region, with all proceeds going to the Healthy Minds Community Group in Hedland. The evening will feature entertainment by local band Brad Hall and the Bad Influence, former AFL star Heath Black, a live auction, raffles and fine dining. Prizes will be awarded for Belle and Beau of the Ball, Most Creative Outfit and many more, so come dressed in your best! 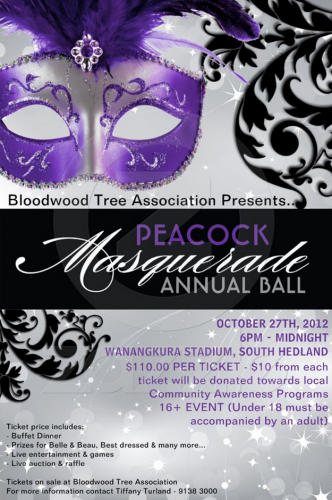 For tickets, please contact Tiffany Turland at events@bloodwoodtree.org.au or (08) 9138 3000. The Bloodwood Tree Association is a not-for-profit Aboriginal corporation based in South Hedland that seeks to help the Indigenous community in a variety of ways, including employment programs, services for homeless people and substance abuse programs. YMAC Congratulates Janet Stewart for NAIDOC Award! YMAC would like to extend a big congratulations to Janet Stewart, who was honoured with a Lifetime Achievement Award at the 2012 Hedland NAIDOC Awards two weekends ago for her work mentoring Aboriginal chidlren. Mrs Stewart is Nyangumarta woman and local teacher at South Hedland Primary School, where she teaches traditional language. She has also helped to establish Nyangumarta dictionaries through the Wangka Maya Aboriginal Language Centre, and is strongly involved in several Indigenous women’s organisations such as the Mothers of Australia Shed, Pilbara Indigenous Women’s Aboriginal Corporation and Mothers Against Drugs. We also congratulate all other nominees, finalists and award winners. For more information about NAIDOC week 2012, visit the NAIDOC website. Families in Karratha, Roebourne, Wickham, South Hedland and Port Hedland can now apply to the Smith Family to receive a refurbished home computer, a four-week basic computer training course, and a year of internet access, all for free. The Smith Family’s Technology Packs initiative, in partnership with Royalties for Regions and BHP Billiton, was designed to provide families with a computer connected to the internet at home at an affordable cost. To be eligible, families must have school aged children, have proof of low income status (health care or pension concession card), and not already own a home computer. The Smith Family is a children’s charity that helps disadvantaged children. Click here to learn more about the Smith Family. The “Tech Pack Project” aims to improve community digital literacy, equipping children and their families who may otherwise not be able to afford computers, with the technological skills that are now prerequisites for participation in lifelong learning and social inclusion. According to the Smith Family, research shows that access to ICT (information, communication and technology) can increase study and employment opportunities for parents and young people, improve the capacity of parents to support children at school, increase the engagement of children at school, and improve individual’s self-esteem and overall wellbeing. Marnti Warajanga- a Walk Together is an exhibition of photographs and stories that will be touring Pilbara communities this May and June. Showcasing the photographs of Tobias Titz, including many images of the Nyangumarta people’s native title determination in 2009, the exhibition has been on display at the Museum of Australian Democracy at Old Parliament House in Canberra. Everyone is welcome to participate in the different events by trying some yandying, taking the children’s trail or having their portrait taken at the photographic workshop. The exhibition will also be on display in Perth before heading north, from 13-30 April in Central Park. For more information and to view some of the photographs visit the Marnti Warajanga page at the Museum of Australian Democracy’s website.